Tricia's Take: JOTD- Army green but not mean! I tried on this suit and am on the fence, I think for that price I had better LOVE it and look like a million bucks, since that is almost how much it cost! And finally can I tell you I never tire of taking pictures like this with my laptop! My kids and I do it for hours and can't stop laughing! 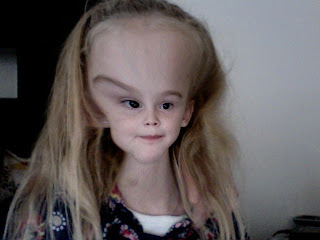 Ha ha this cracks me up, alien head!!! Have a wonderful weekend ladies!!! Sounds like you had a fun girls day out! THose are the best. Love that jacket on you...the ruffles are the cutest part, of course. That bathing suits is seriously cute, but I agree. If it's not love, find something else. You'll find something you love even more. Your hair looks great against the green. And your food description if leaving me hungry! I want to eat a batch of cookies. I have not met a cookie I can yet resist. You look so cute in that coat! Oh those cookies look awesome. I've been eatin wayyyy too much even though I'm working out, so not a pound shed! Oh well! 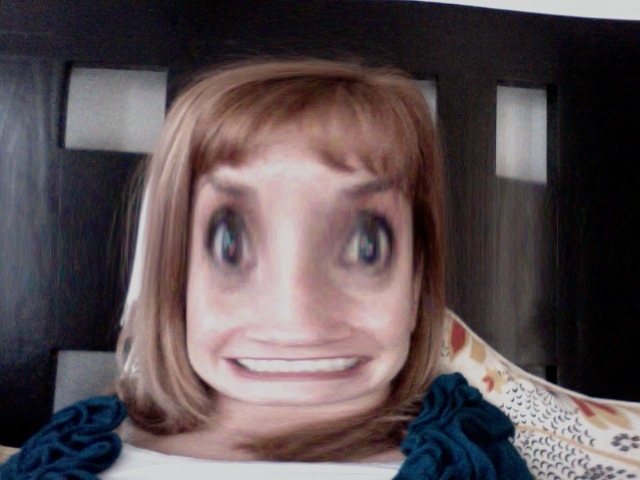 We have spent hours laughing over photo booth. Love the coat and the army green color looks perfect on you! Was this a day out with Jessica or another sister? I totally miss Jess and her posts, and hope her move is going well!!! Those pictures are funny - I can imagine what a kick your kids get out of that! I love the ruffles on this jacket. It gives a girly touch to a tough jacket. Those pictures are so funny! What a fabulous jacket! I love all the ruffles. You look super cute! Ha I love those pictures. Too funny! Your trench is adorable. The ruffles are the reason I adored the Two Paths Trench, but this green color is really great too. Hmm... And I see Bianka peeking out underneath. I'm really wishing I had taken the plunge on that one because everyone looks so great in it! 1. WHAT holiday pounds? 2. 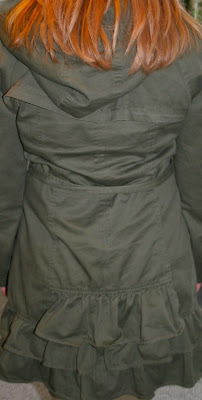 LOVE the ruffles on the otherwise military style jacket. 3. THAT BATHINGSUIT is gorgeous! But the price would freak me out, too! It's a bathingsuit! I was going to ask the same as Jan-I hope Jessica is doing well! Miss her! That jacket looks awesome with your hair. dang it. I missed that one. Oh wow I LOVE doing photobooth with my kids! And also I love your clothes, they are GREAT.